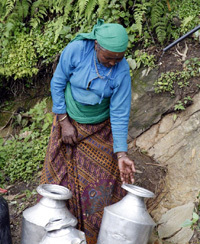 The Nepal Trust supports local communities to utilize the world’s most important resource – water – in a sustainable way. The Nepal Trust promotes WASH activities and helps people to access clean drinking water resources, provide assistance to raise awareness among communities on the importance on clean drinking water, water provision, sanitation measures and hygiene issues (e.g. food preparation). Clean water contributes to food production, raises the health and hygiene standards in villages, is utilized by local tourism industries and of main importance to daily life of villagers. Currently the Trust is focusing on water supply schemes, promotion of proper water usage and water-health related issues.